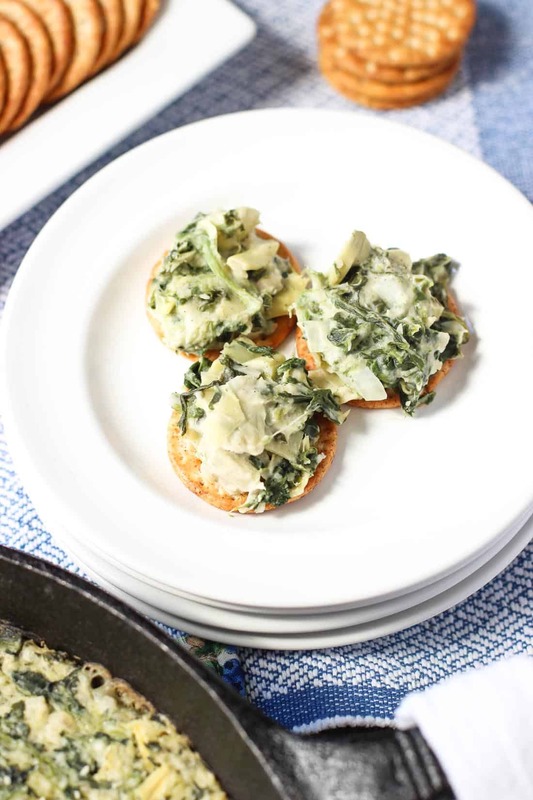 This recipe for healthier spinach artichoke dip is easy, creamy, and sneakily lightened up thanks to a special ingredient. This warm dip is a perfect appetizer for game day! If it was after 10 pm and I was hanging out with my friends in high school, there was a solid possibility we were at Applebee’s for half-price appetizers. I think it started at 10 pm? Maybe 9? Anyway, we would specifically time our arrival to coincide with half-price apps. And nine times out of ten we would get the appetizer sampler, which of course was the only thing on the app menu that was full price. Without fail! Leave it to us to choose the one thing exempt from the special. Each time we’d read the menu as if we all were keeping an open mind as for what we’d order, but indecisiveness would inevitably set in and before long that sampler plate would be headed our way. And the one thing we all had googly eyes for? Spinach artichoke dip. It owned us. Back then you couldn’t pick your sampler components, but I *think* the other two apps were mozzarella sticks and quesadillas. 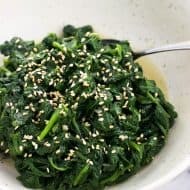 I’m a little concerned I can’t recall such important details of my childhood, but when you’re eyeing up your friends to see who would scrape the last shred of spinach off the bottom of the bowl by the last fragment of a chip, lesser details fall by the wayside. Sadly inhaling spinach artichoke dip like you don’t have school tomorrow there’s no tomorrow doesn’t fly on the reg anymore, so I lightened it up just enough to justify a snack attack every now and again. One of my favorite healthy tricks to pull when it comes to lightening up dips is to use cannellini beans. 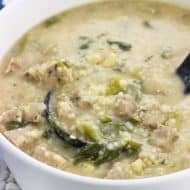 They have a relatively mild flavor that, once blended in the food processor, mix right into whatever dip you’re preparing and give it a creamy texture without piling on fat and calories. A win-win, right? Right. 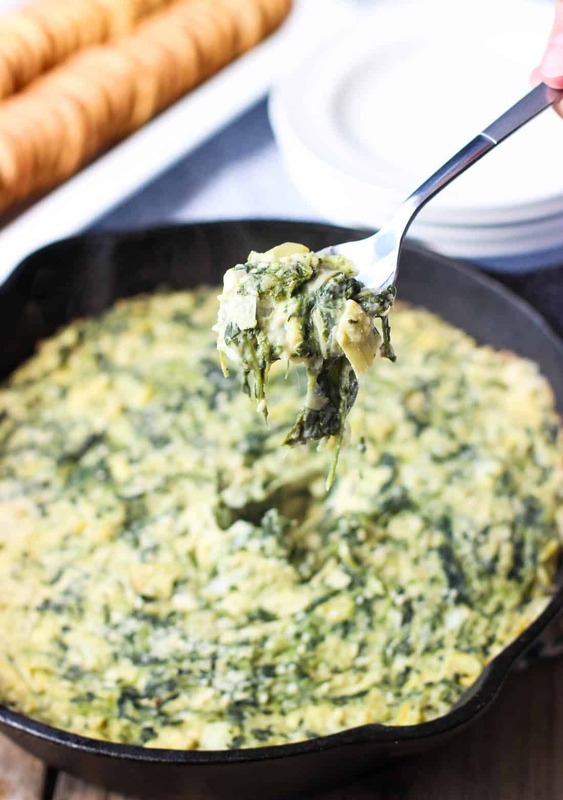 This healthier spinach artichoke dip is also PACKED with spinach. Packed! 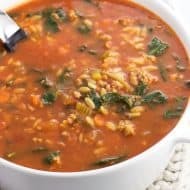 I love sneaking vegetables into dishes that aren’t typically thought of as lighter bites. I’m looking at you, game day appetizers. 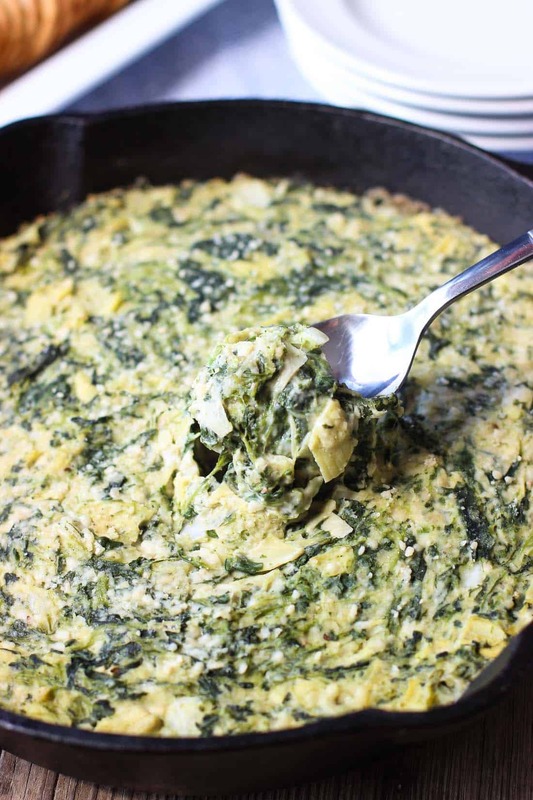 This healthier spinach artichoke dip is easy breezy to make. First you cook the frozen spinach according to the package directions, then blend the cannellini beans and olive oil in a food processor. All that’s left is to stir all of the ingredients together and bake until the cheese is melted and gooey. Just a few flavor notes: I am a big fan of garlic, so there are two tablespoonfuls (or a little more…) in this dip. The garlic flavor isn’t crazy strong in the end result, but if you’re not as big a fan as I am, you can certainly use less. Then using two teaspoons of hot sauce (I used Tabasco) gave this spinach artichoke dip a pretty mild little zip. If you’re digging the heat, add as much extra as you like. One of the times I’ve made this dip I experimented with preparing half the batch using dairy-free cream cheese and omitting the Parmesan cheese. Since no one in our taste tester audience has a true lactose-intolerance I didn’t bake the two versions in separate baking dishes, rather I carefully spread half of the mixture in one half of the dish and spread the other over the rest (topping the dairy-free side with toasted breadcrumbs so I could tell the difference once it came out of the oven!). The two halves looked practically identical and cooked up just the same. 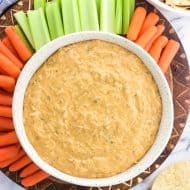 While the dairy-free side didn’t have the little melty bits of Parmesan flavor that I just love, the dairy-free cream cheese certainly became gooey and made for a satisfying, dairy-free dip. If preparing without the Parmesan, you may wish to increase the quantity of seasonings and spices to mitigate the loss of Parmesan flavor. 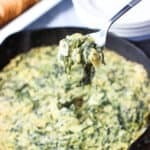 Healthier spinach artichoke dip for everyone! 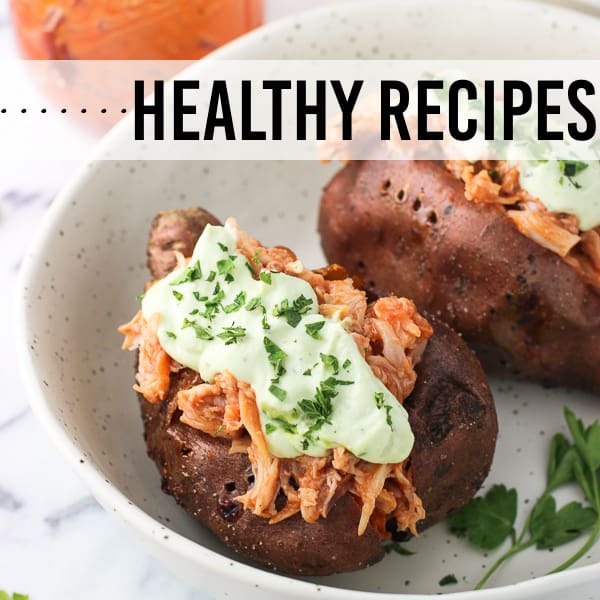 PS… While not quite as healthy, check out these Spinach Artichoke Smashed Potatoes. YUM. Prepare spinach according to package directions. 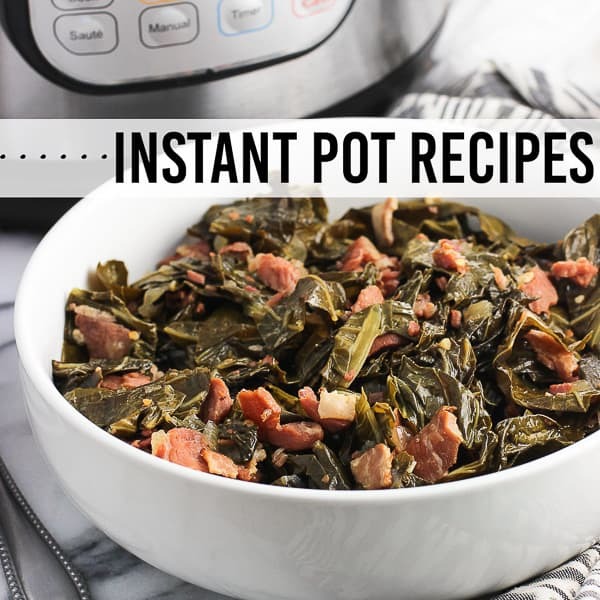 Preheat oven to 375 degrees F. Once spinach is done cooking, drain and add to a large bowl. In the bowl of a large food processor, blend cannellini beans and olive oil until mostly smooth. Add mixture to the bowl with the drained spinach. Add the rest of the ingredients to bowl and stir to combine evenly. Place mixture in an oven-safe baking dish (I used a cast iron pan). Top with additional Parmesan if you like. Bake for 20-30 minutes, or until dip is heated throughout and cheese is melty. Serve while warm. See note above regarding dairy-free substitutions/omissions. In a pinch, I've used a 15-oz. can of rinsed and drained chickpeas when I wanted to make this dip and realized I was out of cannellini beans. I followed the same steps as written above and it worked as well! I made this yesterday for the super bowl and it was a HUGE hit! I followed the recipe exactly, except for throwing in a tiny bit more cream cheese (1-2 oz) hoping to balance out the amount of spinach. I’m not a big spinach fan so I felt like it was a lot. Nobody at the super bowl could tell it was “healthy”! Thanks for the recipe! So glad you and your crowd enjoyed this dip, Christi! 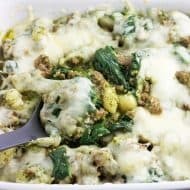 And good idea to tweak the recipe with a little extra cream cheese if spinach isn’t your favorite. I made this dip yesterday too, and there certainly is a lot of spinach. 🙂 Thanks for writing in! Thanks Denise! Yeah I’m the same way. It was nice to be younger and blissfully unaware of the caloric-bomb that is restaurant spinach artichoke dip haha. haha oh gosh Applebees was one of the very few chain restaurants in the town I grew up in! 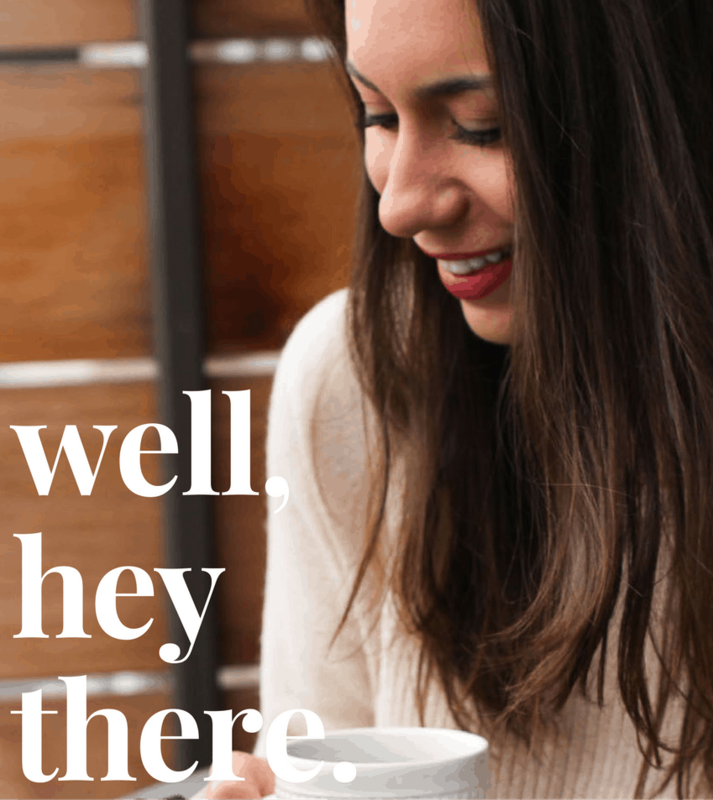 That made me laugh – we always hung out there too! 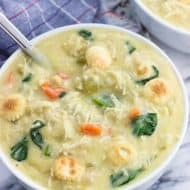 And I LOVE that you used cannellini beans to lighten this up! It sounds so so good! Haha it was quite the place to go! We would play a game where before we walked in we’d guess how many people we’d recognize in there over the course of the night. It was usually in the 20s haha! I always go for the spinach artichoke dip, and knowing that it’s healthier is a huge plus! I love that you added cannellini beans to this to lighten it up — this is happening soon! Thanks Marcie! I pretty much always find myself hanging near the appetizer table if there are dips at a party. I just can’t get enough! Thank you Catherine! I was so happy to lighten up this delicious appetizer! My friends and I did that in college too! Haha! Oh my gosh! Half price appetizers was where it was at. You could pig out for so cheap. And of course I loved the spinach artichoke dip. But this sounds much healthier. I won’t feel so guilty after eating my way thru this skillet. Ha! Haha they were the BEST. 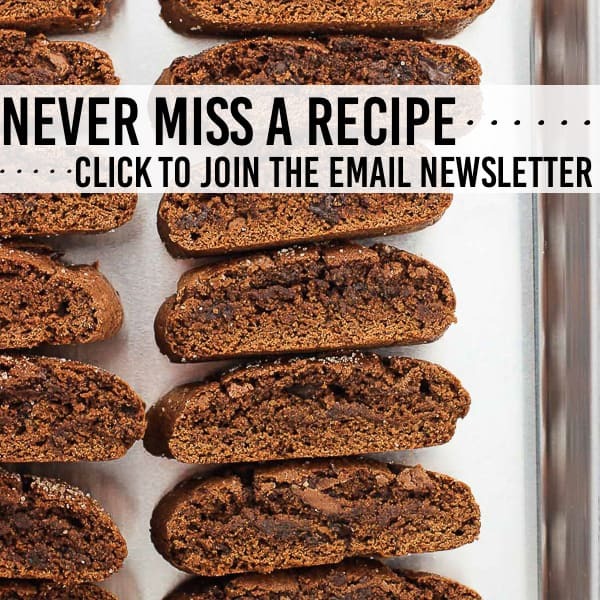 I can’t even imagine the real recipe they use. Definitely an infrequent treat I’m thinking! Ah! My mom was always obsessed with their dip!!! Haha! Haha! It’s been awhile since I’ve had it but it was sooooo good!